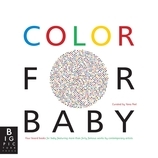 Let the world’s best-known artists introduce your baby to the joy of color in this third title in the unrivaled Art for Baby series. Four mini fold-out concertina books, themed on red, yellow, green, and blue, feature famous works from Andy Warhol, Jeff Koons, Roy Lichtenstein, Damien Hirst, Henri Matisse, and Yves Klein, among others. 9 7/16" x 9 7/16"
Yana Peel is the CEO of Intelligence Squared. In 2011, she was honored as a Young Global Leader by the World Economic Forum and received the Mont Blanc Award for Arts Patronage. She has two young children.